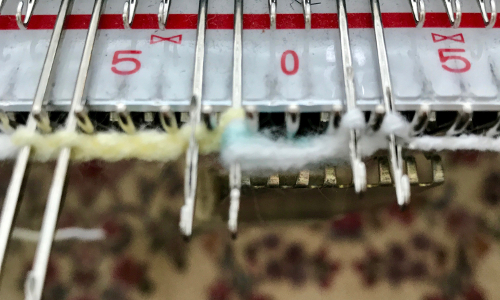 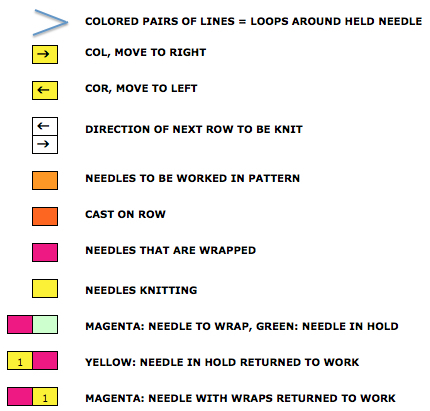 Working from right to left, starting with COR; the first pair of needles on carriage side in work, remaining needles away from carriage are in hold position moving toward left, the adjacent needle in the first pair in hold gets wrapped; be sure to retain proper positions for knitting and holding the first wrap completed, needles in position to continue the process is repeated X number of times. 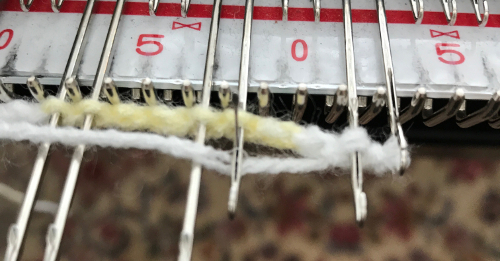 I chose to wrap X 5, which requires 10 rows of knitting, making the row counter usable to track rows in easy increments. When wraps are completed, push wrapped needle and its partner into work, knit one row make certain all the loops have knit off , wrap the first needle to their left, bring pair on the right to hold continue for your desired number of wraps return wrapped needle and its partner to work position, knit one row, wrap next single needle on left remember to bring needles to right of the pair just knit into hold repeat to end of row. 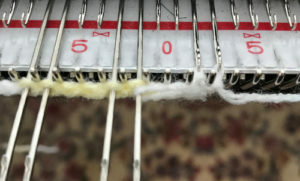 Reverse process moving from left to right (in progress photo). 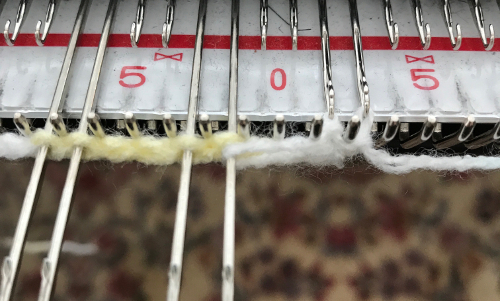 I found a single tooth from a claw weight on pair of stitches doing all the knitting helpful. 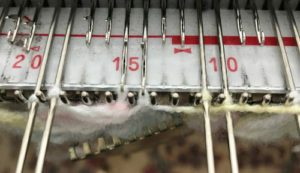 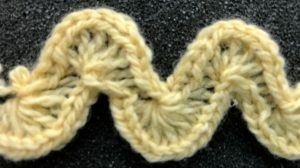 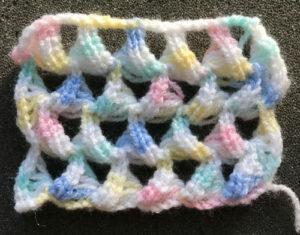 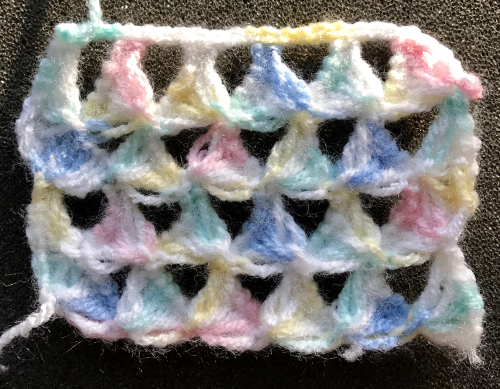 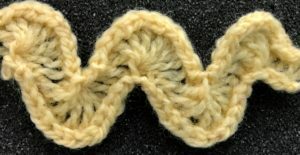 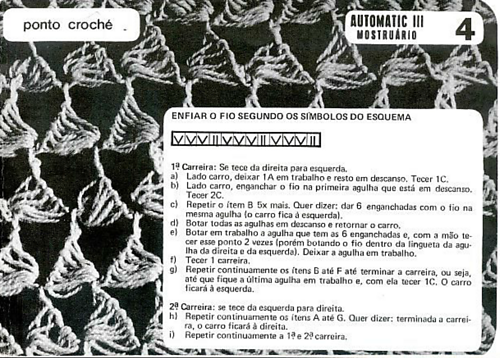 Variations can include the number of needles used for knit stitches or ladders width created from NOOW, yarn choices, etc.